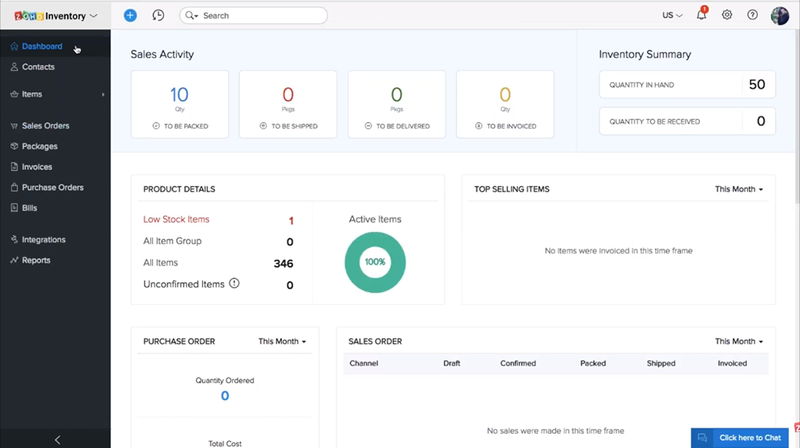 Zoho Inventory is an inventory management software for growing businesses. It helps you keep track of each item or batch in your inventory through serial number and batch tracking features. It has an efficient order management system for managing online and offline orders. With the multi-channel inventory management tool, expanding your business online is streamlined by selling your merchandise in integrated marketplaces. This cloud-based inventory control system lets you maintain a centralized inventory with functionality such as item kitting, automatic reordering, stock adjustments, barcode inventory management, serial number tracking, and batch and expiry date tracking. Its key features also include warehouse management, multi-channel selling, order management, order fulfillment, and insightful reports. Zoho Inventory reviews indicate you can expand your business by selling your merchandise on Amazon, Shopify, Etsy, and eBay. It lets you keep track, manage and fulfill orders in these marketplaces by integrating with your online store easily while eliminating manual, repetitive tasks. Automating tasks also frees up your time to focus on more crucial processes to increase your revenue. You can learn more about Zoho Inventory pricing here. Expedite your order processing by centralizing your order management. The software enables you to manage sales and purchase orders, create packages and send delivery updates from a single platform. In addition to inventory control and management, it also helps you maintain stock levels and manage inter-warehouse transfers. Tracking is streamlined with the tool’s serial number and batch tracking feature. Zoho Inventory reviews share how the tool extends its capabilities by integrating with third-party systems. It has multiple shipping integrations to provide fast and efficient delivery service to your customers. Accounting and CRM integrations also sync your contacts and order data automatically to optimize financial data management with ease. For more information about the software check out this Zoho Inventory review.